This is a journal page featuring the Calvin Collage Sheet and birds from the Magpies, Ravens, and Crows Collage Sheet. 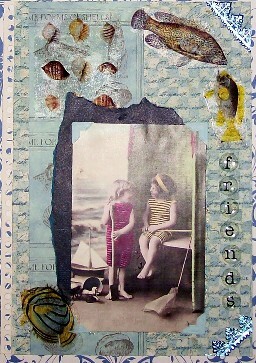 This is a journal page featuring the Celeste Collage Sheet and some UK bus tickets! 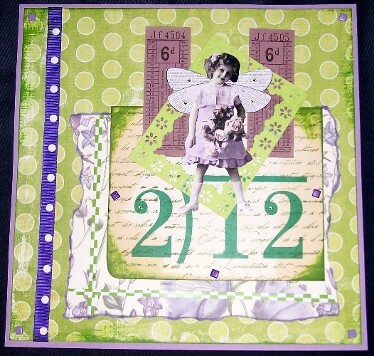 This is a journal page featuring an image from the Cemetery Angels 12 collage sheet. 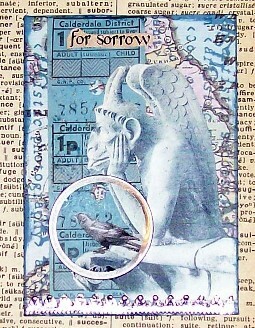 This is a journal page featuring an image from the Cemetery Angels 15 collage sheet. 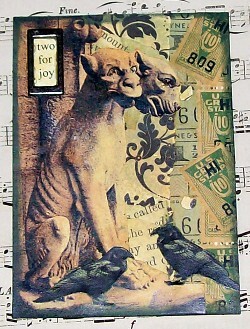 ATC's with gargoyles! 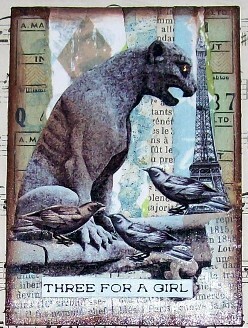 Images from Silent Guardians, The Watchers and Magpies, Ravens, and Crows collage sheets. A small metal rim tag is used. 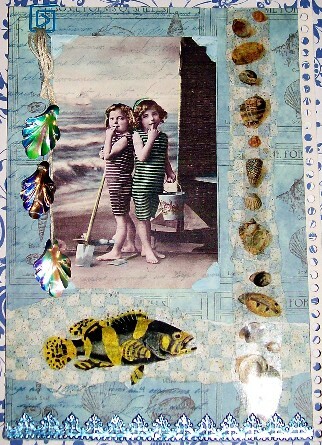 Journal pages using images from the Lazy Days and Beneath the Sea Collage Sheets! 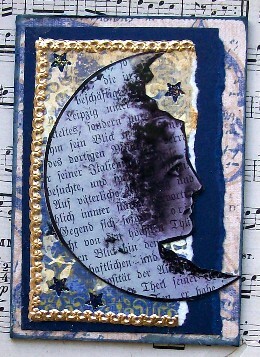 Light blue baroque German scrap is also used! 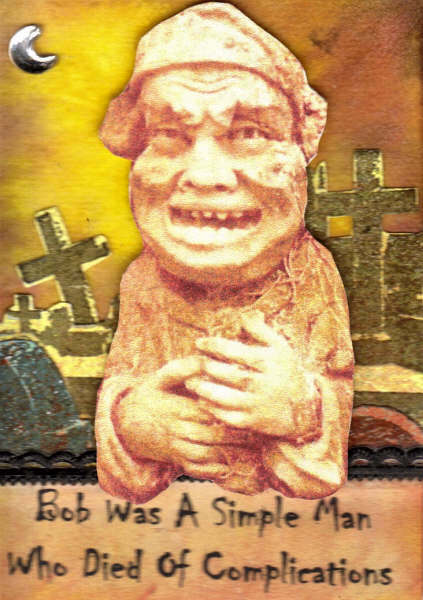 Thanks to LuAnne Boyce for submitting her "Mr. Bob" ATC. 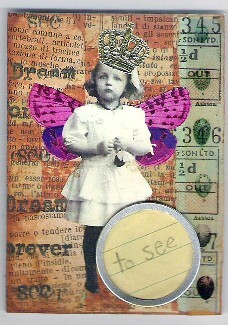 She used an image from the Vickie Enkoff Gargolyes collage sheet. 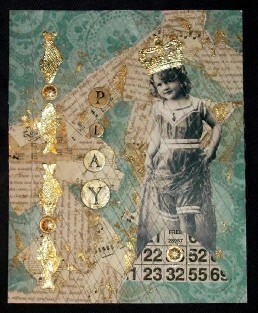 A journal page using the Madeline collage sheet and round satin sequins! 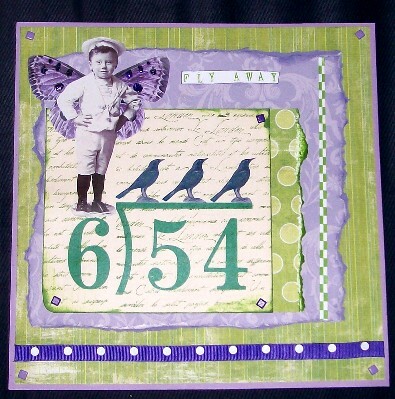 These journal pages use images from the Tiny Treasures, Home Team, Andrew, ATC Sheet 01, Secret Identity and Love Me Collage Sheets. 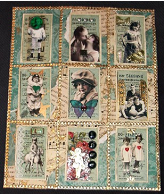 Gold fish German scrap, Gold French German scrap border, red mini embossed heart sequins, small gold star German scrap, vintage cigar band labels, vintage books pages, bingo card blanks, large gold crown German scrap and cream millinery netting are also used! 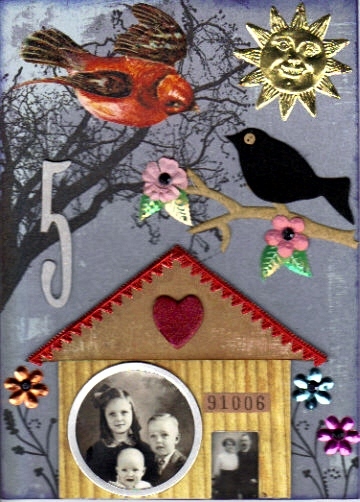 Thanks to Heather Cockrell for submitting these samples made with the Vintage Children ATC kit. Heather also used the small gold German scrap crowns and stamps from the Unmounted sheet 6 and Raven Friends UM Rubber Stamp sheet. 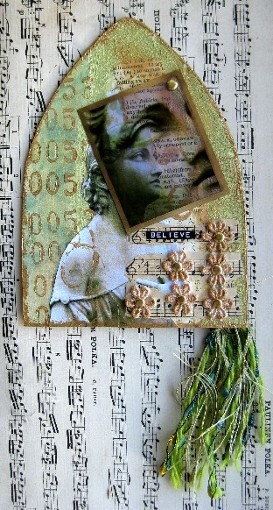 Thanks to Joanne McIntyre for this ATC featuring the Andrew collage sheet! 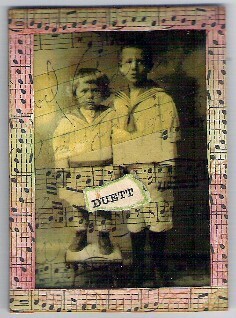 This is an APC (altered postcard) submitted by Susan Burgess. 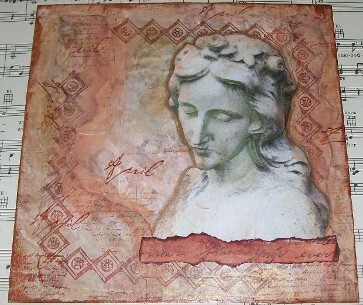 She used the Giselle fabric image. 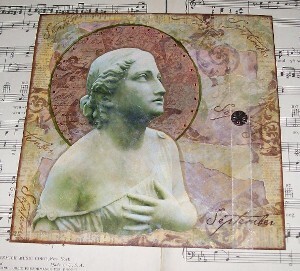 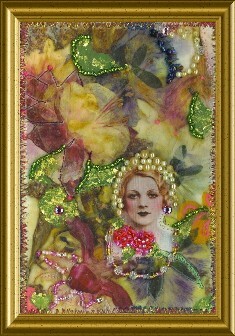 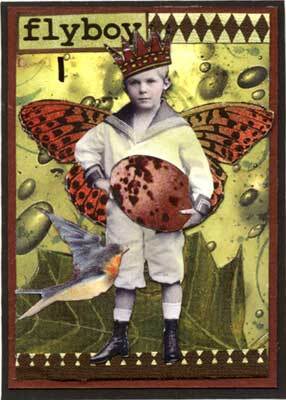 This ATC uses the tiny gold French border German scrap and an image from the Heavenly Bodies collage sheet transparency. 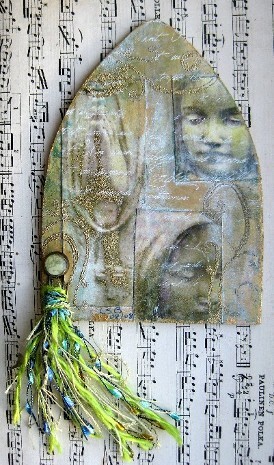 This is the front and back of a gothic arch. 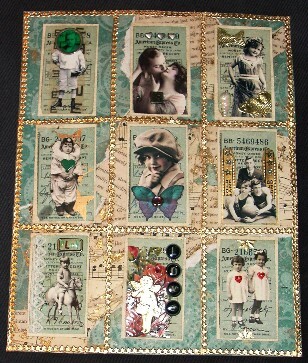 It uses images from the Cemetery Imagery collage sheet and Cemetery 12 collage sheet. 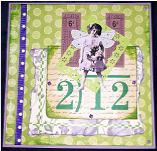 Click here to see stamp art samples! Thanks to LuAnne B. for this wonderful ATC using the Gothic Paris Rubber Stamp sheet, Paris Cemetery #1 Collage Sheet and Cemetery Angels #8 collage sheet. 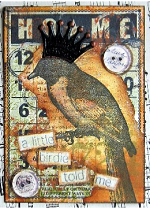 Thanks to Heather C. for this wonderful ATC using the Our Bird Friends Rubber Stamp Sheet, Clear Buttons, Black Royal Crown German scrap, and an ATC sized bingo card. 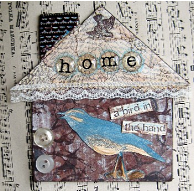 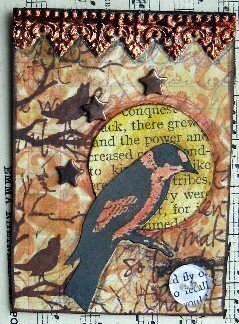 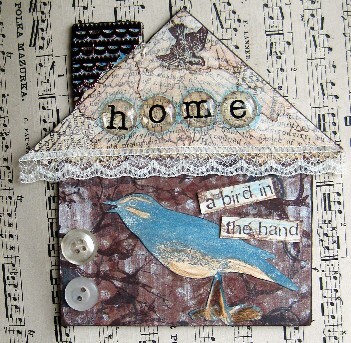 Another great ATC by Heather C. using the Our Bird Friends Rubber Stamp Sheet, and Brown Lace Border German scrap. 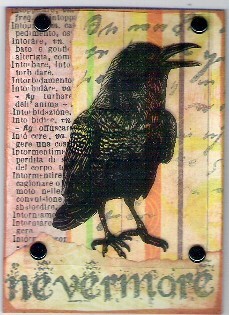 Yet another great ATC by Heather C. using the Our Bird Friends Rubber Stamp Sheet, Brown Baroque Border German scrap, and Clear Buttons. 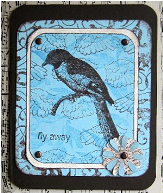 A big thank you to Heather C. for submitting this sample using the Our Bird Friends Rubber Stamps, Brown Lace Border German scrap, and a Maya Road House coaster book. 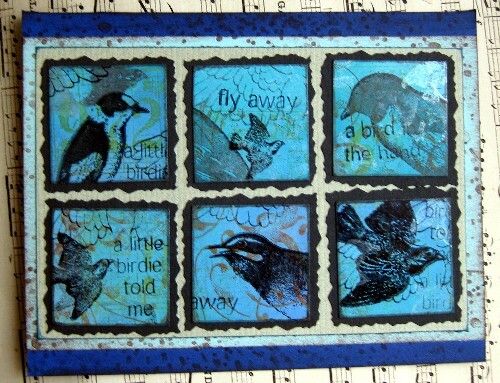 A big thank you to Heather C. for submitting this greeting card sample using the Our Bird Friends Rubber Stamps, and Stylish Background Rubber stamp. A big thank you to Heather C. for submitting this second greeting card sample using the Our Bird Friends Rubber Stamps, and Stylish Background Rubber stamp. 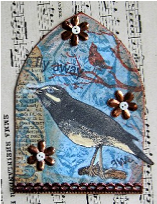 Wonderful art sample by Marcy H. Marcy used the microfelt birds, heart and home chipboard, gold sun German scrap, small clear metal rim tags, an image from the vintage image CD #2, an image from the "On the Wing" collage sheet, a tree stamp from the Raven Friends rubber stamp sheet, red Renaissance German scrap border and various Collage Stuff sequins.